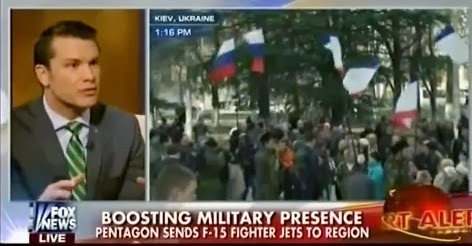 CEO of Concerned Veterans for America, Pete Hegseth, whom I interviewed in 2007, joins Fox News to discuss the most recent events in the Ukraine, specifically the reports that the Pentagon has just send F-15 fighter jets into the Ukraine region, where he explains the optics and how Russian President Vladimir Putin is playing a strategic game of chess while the US President Barack Obama is playing marbles. Hegseth makes the point that Putin is acting on the signals he has read from the Obama administration, which is “weakness and equivocation,” and is acting accordingly. Hegseth’s analysis is spot on and well worth listening to.